The 2011 crop failure in The Gambia was mainly attributed to Climate Change and this has greatly affect the lives of local people particularly the women farmers whose survival, school fees, health bill, feeding depends on it. 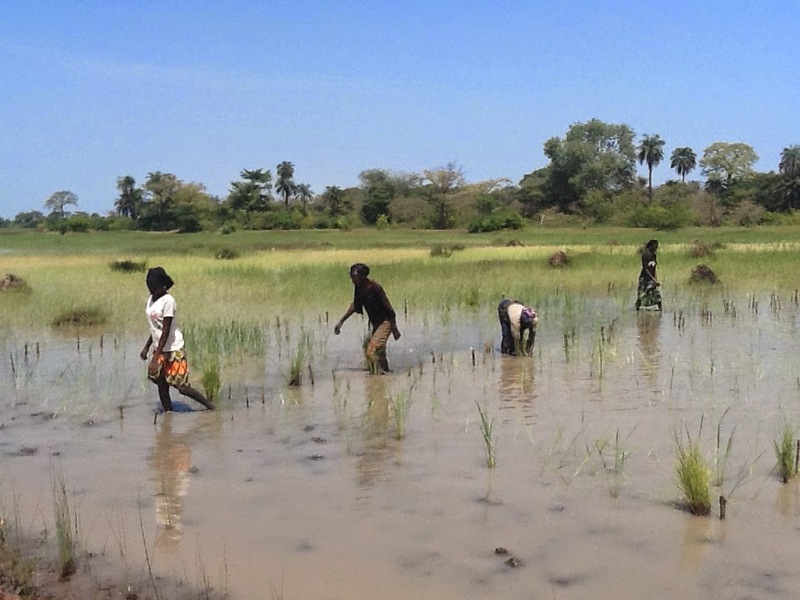 In Central River Region a provincial region in The Gambia, there are six hundred and sixty-nine villages and these communities are farming communities who were hard hit by the effects of climate change, thus warranting the government of The Gambia to declare crop failure and called on international communities for support according to a statement from the presidency. Climate Change is one of the major challenges hampering agricultural development in Africa, especially in the West and Gambia in particular. This change in long-term weather conditions is threatening food security and according to reports local people are hungry and more people will go hungry according to media reports. Agriculture-based livelihood systems that are already vulnerable to food insecurity face immediate risk of increased crop failure, new patterns of pests and diseases, lack of appropriate seeds and planting material, and loss of livestock (NDMA report 2012). It is essential to have climate summit because is not secret that climate change is altering the temperature at a great degree particularly in the sub-Saharan African the changes in excessive heat, abnormal flooding and humanity needs urgent actions to remedy or minimised effects of climate change. It is one thing to have the summit but another thing is to act on the outcomes of the summit and this is what the United Nations is trying to do; for instance organizing a Summit and engage governments to come up with achievable plans to curb climate change. For example in Central River Region over one thousand people rendered homeless due to flood and most of them were temporally house before the government and relief agencies could come to aid. I believe the UN Summit provide a unique platform for leaders to champion an ambitious vision, anchored in action that will enable meaningful global agreement in 2015. The Summit encourages and urges world leaders to commit themselves financially or order wise to support the implementation of the outcomes of the summit. Climate change can be tackling but requires collective and concerted efforts with multi-dimensional approaches to address it. The effects of climate change if not adequately address would continue to disrupt national economies, increase disaster related problems causing low crop productivity thus aggravating poverty. The government of The Gambia in collaboration with relevant CSOs and NGOs are currently embarking on mangrove restoration and engage farmers to go in for early maturity crops to avoid been hit by erratic rainfall which causes low crop productivity. However, communities are urged to adhere to the information provided by Ministry of Agriculture for the benefit of the local farmers. CSOs and communities have the belief that there are solution are available to cleaner more economies. The world general body such as UN is in the position to be able to informed their member states to ensure the dangers of emission on the various continent and this has negative impacts on the flora and fauna and these issues needs to be discuss of national level, so the government has to be committed to be able to put in places mechanisms and plans to ensure that the masses are educated on the effects and ensure that people are adhering to the resolutions that emerged from the UN summit. However, looking at the statistic climate change is caused by the developed nations such as USA, UK, China among others, who are emitting a lot of carbon dioxide and yet they less affected from the effects of climate change. The poor and vulnerable Gambians greatly suffers from the effects of climate change this is something that the summit must address only in principles but in actions to ensure that developed and highly industrialized nations limit their carbon emissions. Environmental crisis leads to drops in production of food crops but also in pastoral activities. Climate Change makes such crises recurrent, thus becomes one of the biggest challenges for local farmers. Evidence, has shown that climate change is affecting all the food dimensions food availability, food accessibility, food utilization and food systems stability. This has impacted negatively on the livelihood of the local people (DPWM 2010 report).